Summary: Active first half of the week with a couple of storm chances. Most attention is being placed on Wednesday’s system. Slightly cooler and dry ending to the work week, with a picture-perfect weekend in store. Tennessee Severe Weather Awareness Week started yesterday, and we are going to get our fair share of awareness this week with a couple of chances for severe weather. The main one being on Wednesday. Note: This post is long, and somewhat dense. But please embrace this post as a picture or snapshot of this moment in the forecast, and understand that it can and will change. I encourage you to check back tomorrow when I post a new site update, Wednesday morning with a new site update, and any time in between on Twitter at @DicksonSevereWx. Forecasts CAN, DO, and WILL CHANGE. Today, we started with some early-morning light showers that have since moved off to our east. We don’t expect any more rain for the rest of the day (other than a light sprinkle in a spot or two). Today’s high will climb to around 60* with winds coming out of the south around 10mph. We are/were outlooked in the “no big deal but may be lightning” category for severe weather for today. Note, this outlook goes from Monday 6am to Tuesday 6am. Tonight, temperatures won’t fall too much, to 54*, while we await a second wave of rain coming in around 2-3am. One of the showers may have some lightning. No severe weather expected overnight. Tuesday sees a chance of storms and severe weather as our high reaches about 72*. Winds will be out of the south at 10 to 15 mph, wth some gusts as much as 25 mph. For Tuesday, we are outlooked for a MARGINAL risk of severe weather, or a 1 on a scale from 0 to 5. Note this outlook goes from Tuesday 6am to Wednesday 6am. Note: A small sliver of extreme northwest part of Dickson County is outlooked in the SLIGHT category, however, storms don’t stay neatly inside these colored areas (and they are likely to change a couple of times before Tuesday), so for the sake of brevity, I’m treating all of Dickson County as being in the MARGINAL category for severe weather. Our chance of storms increases as we move through our Tuesday morning. There won’t be a line of storms to move through, but an unorganized cluster. One or two of these may become strong to severe. 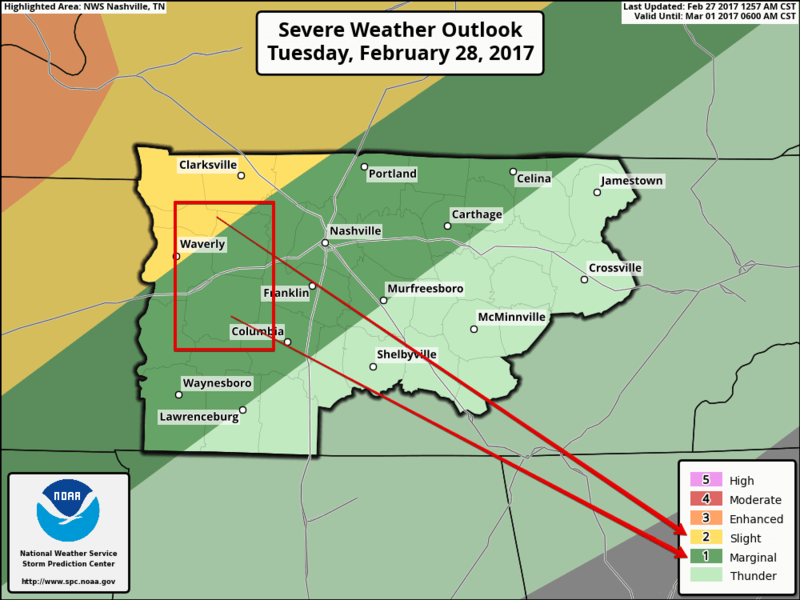 Here’s NWSNashville synopsis for Tuesday. The models aren’t agreeing on timing of Tuesday morning’s system, which is why you see NWSNashville saying 12am to 6am, where the NAM4 (below) shows 6am to 3pm. NAM4 isn’t the only weather model to get this info from. Biggest threat for Tuesday mornings’ storms will be damaging straight line winds and large hail. Below is the NAM4 simulated radar for Tuesday. I’ve trimmed the radar loop to go from midnight Tuesday to midnight Wednesday (24 hour loop). Time is in the upper left corner; 6am is 12z, 3pm is 21z. Most of the rain should be out of the area as we move into the overnight hours. The low temp will drop to about 64 degrees. Note: The Statewide planned tornado drill for Wednesday at 9:30am has been postponed to Thursday at 9:30am to avoid confusing with incoming severe weather. Wednesday will be the most active weather day this week. Our high temperature will be about 70* ahead of a powerful cold front that will come through the area later in the evening, dropping temperatures again. The cold front moving through is what will be driving Wednesday’s severe weather possibilities. We are outlooked in the ENHANCED category for severe weather. Note: Dickson County is split between the SLIGHT category and ENHANCED category, however, storms don’t stay neatly inside these colored areas (and they are likely to change a couple of times before Wednesday). 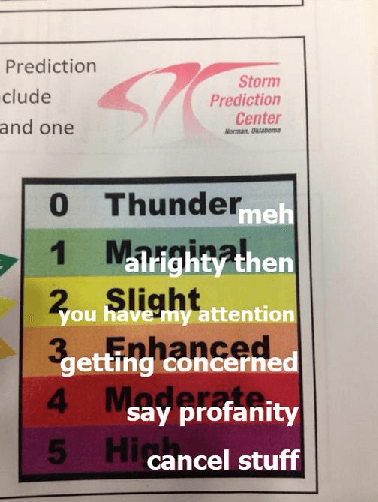 It’s fair to say that northwest Dickson County may see *slightly less* severe weather than southeast Dickson County, but for brevity I’m treating all of Dickson County as being in the ENHANCED category. 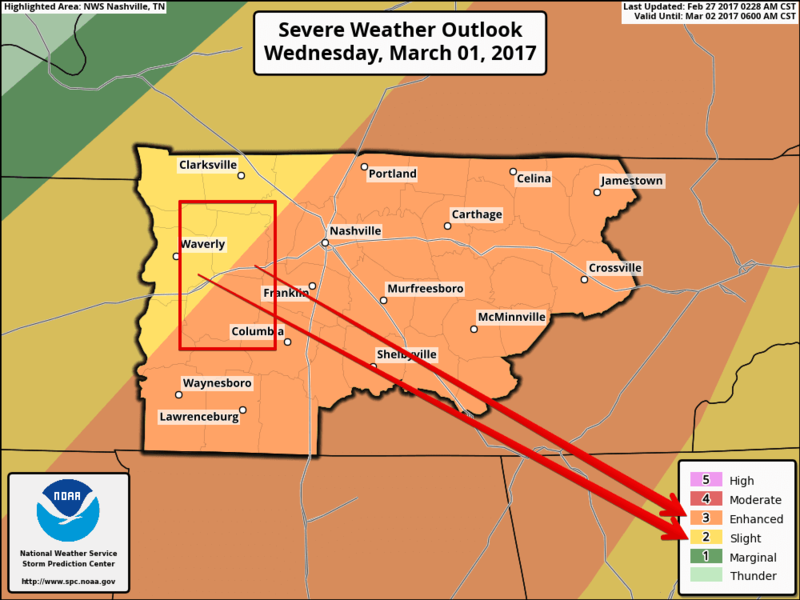 The ENHANCED category for severe weather carries with it from the SPC a 30% chance of seeing severe weather within 25 miles of a point. 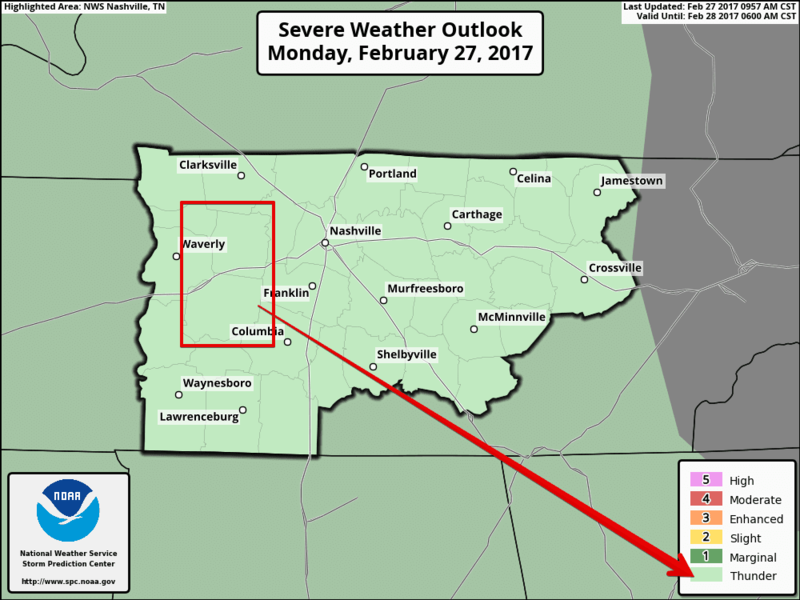 This event is of concern because we are expecting a squall line type event to move through the MidState in the early morning daylight hours. Squall lines are notorious for wind damage events, which is the main threat for Wednesday, especially if we see any bowing structures that shows a force of wind pushing the system out ahead of the rest of the storms. The risk for tornadoes is not zero, but lower than the risk for damaging straight line winds and hail. 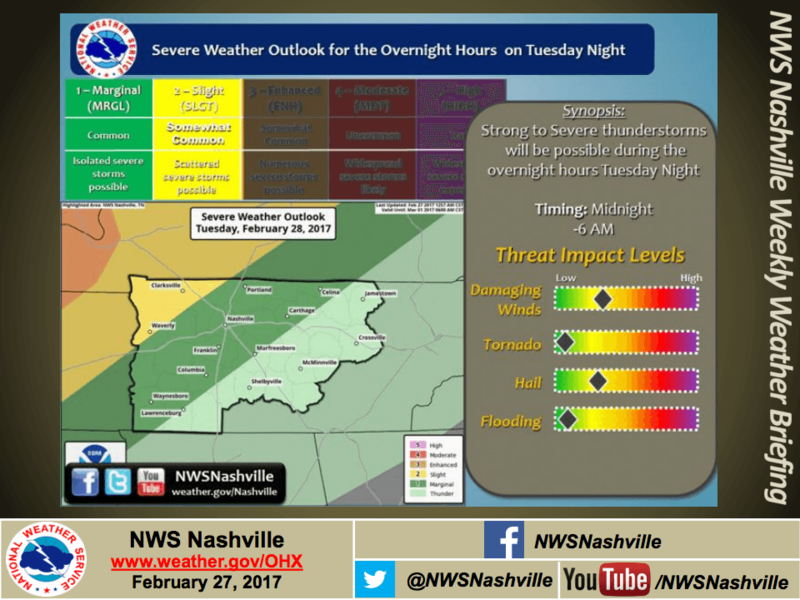 Current NWSNashville timing prediction is between 6am to 6pm for all of Middle Tennessee. Since we are more than 48 hours from the event, the timing is hard to nail down exactly and there is a good possibility it could change. The models also don’t agree on timing. The timing for us is in the early morning hours, around 6am to 10am time frame. Here’s the NAM4 simulated radar prediction for Wednesday. I’ve trimmed the radar loop to start at Wednesday midnight and it ends at 6pm Wednesday. The NAM4 shows some showers and storms developing ahead of the main front, which is entirely possible. One or two of these ahead-of-the-line storms may be strong to severe. Late Wednesday things will call down as the system moves east and colder temps start filtering in from the northwest. Overnight low temp will drop to about 37*. May have some concern with frost and sensitive vegetation overnight Wednesday. After the severe weather of Wednesday passes, the end of the work week looks better than the first half. Thursday and Friday will have cooler temps than we are used to, with highs in the low to mid 50’s. Thursday night we will have to watch for freezing low temp of 32* and maybe some frost, so we may want to watch our plants outside that need protection. The weekend shapes up to be a picture-perfect weekend that warms up to more spring-like temperatures and no rain chances currently. High temps in the low to mid 60’s with low temps in the low 40’s.